Final issue of Spicy Adventure. Everything is ripped to shreds, but the cap is pristine and has not budged. Amazing. While technically the last issue of “Spicy” Adventures, the magazine continues on for four more years and eighteen issues as “Speed” Adventures. The covers still pictured women in peril, but the clothing was a lot less tattered. Signature looks funky, but that’s gotta be Norman Saunders. 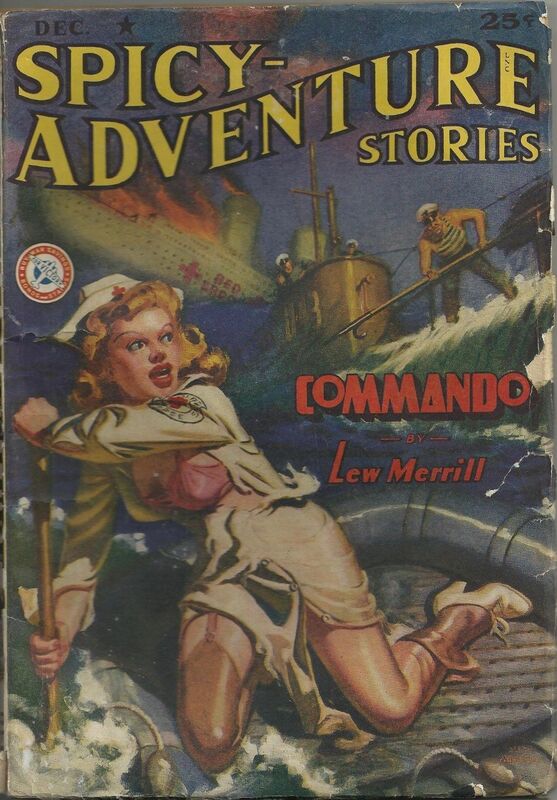 I can’t even see a signature, but from the treatment of the waves and the style of the lady I’m going to guess Hugh Joseph Ward, a regular Spicy cover artist around this time period. Fantastic site, I love it, thank you! If that’s Ward I will buy you a drink, Chris. Way too busy, especially in the background. And the woman’s squared-off, thick-lipped face really looks like Saunders work to me. I could be wrong, naturally, but I’m still thinking I’m right. Will we ever learn the answer? With various image enhancments, my best read of the signature is: (an initial) Francis (possibly an additional name, maybe ending er). Chris, if you are still interested, the signature is below and nside her right knee. The artist is definitely Allen Anderson…Well, if David Saunders’ Allen Anderson Checklist in Illustration Issue No. 18, P.49 is accurate, that is.